Javoedge has a interesting set of new cases out for the Tungsten T3 and Zire 71. 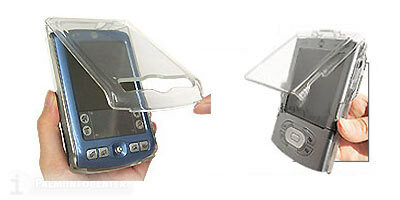 They are a clear plastic that wrap around the handheld for protection that also features a flip cover. The cases wrap around the devices and have top mounted flip hinges. They are clear and made of a poly-carbonate plastic. They feature a built in flip lid (James T. Kirk style), that also allows access to all the devices, cutouts, buttons and slots. The T3 can still be expanded and compacted with the case, and the Zire 71 can also take photos with it attached. Both the Zire 71 and Tungsten T3 versions are now available from Javoedge for $23.95 USD. If it scratches up like the T1, T2 cover, I won't like it. It looks nice, but I've been a Mac user long enough to know that anything shiny and transparent will show up scratches like there's no tomorrow ;) Still it does protect the PDA while allowing you access to the buttons and see the screen so I imagine it would be handy. I'd really like to see PalmOne put a detachable flip cover on the next multimedia Zire, like on my Sony Clie SJ30, I really like having a protective cover which doesn't make the PDA any bulkier in my pocket. Visor Deluxe > iPod > Clie SJ33 > Zire 71 > ? I think the point is that your case gets scratched instead of your pda. Too Funny. Some want to use a case for their pda so that they don't scratch it, then worry about scratching the case? Now, where can I find that case for my PDA case that protects your pda case from getting scratched.....? iJITSU- I think the point is that the case *shows* the scratches. It's nice to have a case that protects your Palm from getting scratched, but some cases (those made of leather or metal) don't get scratched themselves. The whole point of having a clear plastic is that you can see through it, but the clear cases that came with the T|T and T2 got so scratched up as to be unusable after a week. So the question is whether this clear case can protect your Palm, while still looking good. Otherwise why not just get a metal case? My answer would be yes. I never had a problem with the clear case that came with the T and T2. It got small scratches, but never became unusable thus it was much better than a metal case in that you could see data without opening the case. But that was just my preference. I know people who prefer leather, others metal. Whatever works. I just thought it was funny to worry about scratches on something designed to protect something else from scratches. scratches obscure visibility of screen is the point. This is the absolute PERFECT accessory for my Palm Zire 71. Just placed an order for the flip case online. Why didn't anyone think of this sooner...? They did... with the original T|T, and everyone complained about it. I don't see these covers really taking off since they can get scratched easilly and if they break, a sharp piece of plastic may puncture/scratch/break the screen, even with a screen protector. Replacement T|T, or replacement cover? I tried to get another cover when mine was lost, but could not find any at the time. If I find any I'll post a link here. I did not like using two hands the get that cover off, but it did the job. The problem I had is that a little peice of grit between the cover and the case would grind its way through the finish on the Palm, leaving a permanent mark. dsamuilov, I think that any action that would result in the breaking of a plasic flip cover would have most certainly resulted in the breaking of the actual screen if it had not had a flip cover. I would rather have a flip cover break than the actual PDA, and I think that is the point of having this as an option. in the case? it's not clear from their site ... looks cool. I have a Bellagio case that has served me well, but this would be a lot smaller. The case covers the back, so fitting in the cradle on the Z71 is a no, and same for the T3 when the slider is closed. You MIGHT be able to get the T3 to fit in the cradle if you expand it and position it carefully. It will not sit in the cradle in the correct position, but it may sync. Best advice is to ask the company if it will work, or see if they will take the case back if it does not work. Still, it looks like a cool alternative and a good design. I have this case for the T3 and it syncs fine in the cradle when the T3 is extended. I like my Proporta T2 case the best from all the ones I've seen so far! If you haven't seen one yourself, check it out. Maybe you can use this case for TT or T2 as well as T3. I am not sure about this case though. Buttons are stil there easy to acidental activation. I personally own a Krussel case for my TT and for my Sprint Treo 600. Both cases are very slim and works just perfect. Good Luck! The T3 has a key lock so that the buttons do not launch when locked. But compared to a bulky leather case that totally defeats the advantage of having a sleek pda, this is a better solution for some. They also make a unique leather case which would probably fit your needs better. They have better protection and space for expansion cards in a position that does not hit the screen, and it comes with a belt clip. I think the clear case is for those that don't want the extra bulk, but I don't know why they covered the back either. I have tried the metal cases, but some make your device almost twice as thick. Me? I use the stock leather flip, but sometimes I'll even take that off and just have my BoxWave screen protector as the only protection. After going for the maximum PDA/minimum size combo, I did not want to wrap it up in a big metal contraption! Again, T3 CAN be synced in the case and it works perfectly in the Palm Portable Keyboard. The screen cover even stays open. Vaja cases are great! I don't think they are overpriced as they tend to be handmade for each order. And the quality is absolutely the best I've seen of any case. I long for a Palm IIIxe form factor with the flip top. That said, I suspect that the clear plastic covers are to indicate what is inside, so some TSA chimp (no offense intended to that branch of the primate family) does not think you are pulling a gun or something. Kind of like the clear plastic or net backpacks that some schools require. Otherwise, I have no clue why anyone would really want a clear plastic cover. The buttons are exposed... it's the same reason the buttons were exposed on PalmOne's original Tungsten T plastic cover, so that you can look up some quick bit of information without opening up the case or even needing more than one hand to use it. I think it's very practical. Has nothing to do with security, and everything to do with ease of use.